In deserts, which dunes are the most stable? By modeling a desert where the wind blows in two directions, French researchers from CNRS and Universite Paris Dideror have succeeded in observing and highlighting, for the very first time, the formation process and long-term evolution of two types of very large sand dunes: transverse dunes and longitudinal dunes. They have demonstrated that longitudinal dunes and barchans - croissant-shaped dunes formed in a unidirectional wind regime - are the most stable over time. Their results should provide a better understanding of how dunes and deserts evolve on Earth and also help to deduce important information concerning wind regimes on Titan or Mars, for example. This work will be published in the June 2010 issue of the journal Geology. To study the formation and the stability of sand dunes, Stéphane Douady's team has designed an ingenious device that reproduces, in miniature scale in the laboratory, the much larger dunes found in deserts. Their experimental model is made of glass beads set in motion by water in the same way as grains of sand are moved by winds. The advantages are that the resulting dunes formed of glass beads are small (a few centimeters) and build up rapidly under water. 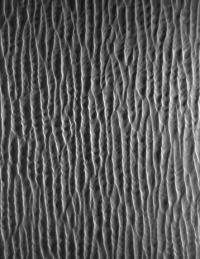 The resulting shapes are similar to wind-generated dunes, which has enabled researchers to study in detail the mechanisms involved in their formation. Previous work carried out by the same team has focused on the dynamics of one type of dune: the barchan, which is formed when the wind regime is unidirectional (which is the case, for example, in the south Morocco desert). These croissant-shaped dunes are slowly moved by wind force. They are now well known and correspond to a relatively simple situation. Therefore, the researchers set about recreating, in the laboratory, more complex dunes that are formed under conditions where the wind blows alternatively in two directions. In real deserts, such conditions give rise to two types of dunes: transverse dunes, in other words aligned perpendicularly to the dominant wind direction, or instead longitudinal dunes (which lie parallel to the dominant wind direction). Their formation process and long-term evolution had never previously been reproduced and monitored: such dunes are very large, measuring several hundreds of meters or even several kilometers, and their morphological evolution is thus very slow. Thanks to the experimental device they have developed, the team of scientists not only confirmed that these two types of dunes are indeed formed under bimodal wind regimes but also highlighted some major differences between them. On the one hand, transverse dunes are formed when the two wind directions are quite similar, whereas longitudinal dunes occur when the two directions are much further apart (the angle between the two wind directions exceeds 90°). In addition, providing there is no sizeable supply of sand, longitudinal dunes remain stable over time whereas transversal dunes, taken in isolation, always end up breaking down into several small barchan-type dunes. Consequently, the most stable dunes over time are barchans and longitudinal dunes (with no external sand supply). These results provide essential insights into our understanding of how deserts form and evolve and the manner in which winds circulate on Earth. They could also help to determine wind patterns on other planets or satellites (Titan or Mars, for example). This model will enable planetologists to check whether the winds generated by their experimental models correspond to the actual shape of dunes observed by satellite. More information: Formation and stability of transverse and longitudinal sand dunes. E. Reffet, S. Courrech du Pont, P. Hersen, and S. Douady. Geology. June 2010. What determines the size of giant dunes?